Just like humans, dogs and cats can suffer the effects of arthritis as they get older. 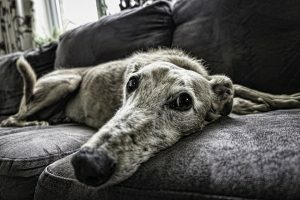 It can cause significant distress, and sometimes humans won’t realise their furry family member is suffering until the condition is quite advanced. You need to know the signs to look for and how to make your pet more comfortable. Arthritis refers to inflammation of the joints. It is very common in both dogs and cats. It is a condition that is both progressive and incurable, yet it can be managed. Between bones that rub together (a joint) is a layer of cartilage which protects the bones. Arthritis occurs when the cartilage wears away or deteriorates, becomes rough, or disappears altogether. This causes pain. Young animals can be affected; however, it is mostly middle-aged and elderly pets that experience arthritis. It is most common in hips and shoulders, and in pets that have had an injury to the area. It is also more common in certain breeds. Arthritis initially causes slight discomfort but this can quickly develop into a very painful illness that is debilitating. While arthritis is an incurable degenerative disease, it can be effectively managed. How can you support your arthritic pet? Regular exercise with dog walking over short distances. Arthritic dogs may enjoy supervised swimming in hot weather. Control weight – arthritis symptoms will be worse in an overweight pet. Note that certain breeds are prone to joint problems, including German Shepherds, Rottweilers, Great Danes, Mastiffs, Labrador and Golden Retrievers, Newfoundlands, Bulldogs, Basset Hounds, and Dachshunds. Be aware of the likelihood of arthritis in your pet, and as soon as you see the signs, or suspect your pet may be suffering, take them to the vet for a full assessment.